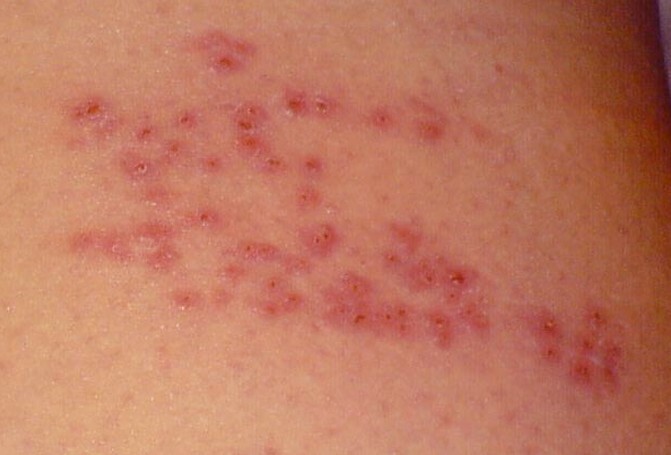 Shingles, also called herpes zoster, gets its name from both the Latin and French words for belt or girdle and refers to girdle-like skin eruptions that may occur on the trunk of the body. The virus that causes chickenpox, the Varicella zoster virus (VSV), can become dormant in nerve cells after an episode of chickenpox and later re-emerge as shingles. 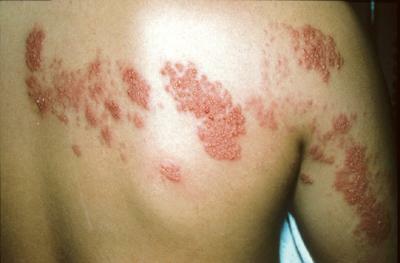 Initially, red patches of rash develop into blisters. Because the virus travels along the nerve to the skin, it can damage the nerve and cause it to become inflamed. This condition can be very painful. If the pain persists long after the rash disappears, it is known as post-herpetic neuralgia (PHN). Any individual who has had chickenpox can develop shingles. Between 600,000 and one million Americans are diagnosed with shingles each year. Overall, approximately 20% of those who have had chickenpox as children develop shingles at some time in their lives. People of all ages—even children—can be affected, but the incidence increases with age. Newborns, bone marrow and other transplant recipients, and individuals with immune systems weakened by disease or drugs are also at increased risk. However, most individuals who develop shingles do not have any underlying malignancy or other immunosuppressive condition. 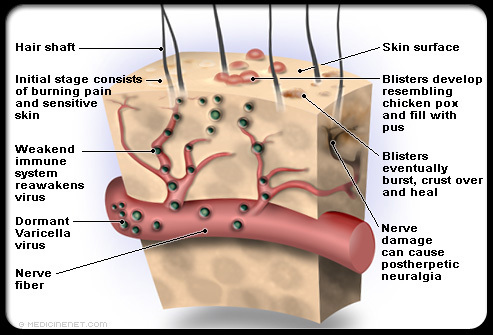 Shingles erupts along the course of the affected nerve, producing lesions anywhere on the body. The condition may cause severe nerve pain. The most common areas to be affected are the face and trunk, which correspond to the areas where the chickenpox rash is most concentrated. There is usually a line of eruptions running from the spine along the path of the affected nerve on one side of the body. The disease is caused by a reactivation of the chickenpox virus that has lain dormant in certain nerves following an episode of chickenpox. Exactly how or why this reactivation occurs is not clear. In 2002 clinicians pointed out that one of the causes of increasing cases of shingles was actually the success of chicken pox vaccinations. It is believed that the reactivation is triggered when the immune system becomes weakened as a result of age, stress, fatigue, certain medications, chemotherapy, or diseases such as cancer or HIV. Furthermore, in persons with HIV, shingles can be an early sign that the immune system has deteriorated. Early signs of shingles are often vague and can easily be mistaken for other illnesses. The condition may begin with fever and malaise (a vague feeling of weakness or discomfort). Within two to four days, severe pain, itching, and numbness/tingling (paresthesias) or extreme sensitivity to touch (hyperesthesia) can develop, usually on the trunk and occasionally on the arms and legs. Pain may be continuous or intermittent, usually lasting one to three weeks. It may occur at the time of the eruption, but can precede the eruption by days, occasionally making the diagnosis difficult. Diagnosis usually is not possible until the skin lesions develop. Once they develop, however, the pattern and location of the blisters and the type of cell damage displayed are characteristic of the disease. Viral culture of skin lesion. Microscopic examination using a Tzanck preparation. This involves staining a smear obtained from a blister. Cells infected with the herpes virus appear very large and contain many dark cell centers or nuclei. Complete blood count (CBC) may show an elevated white blood cell count (WBC), a nonspecific sign of infection. A person with shingles should immediately see a doctor or health practitioner. Although the condition generally clears up within three to five weeks, treatment can ease the painful symptoms. Alternative medicine remedies and therapies will not cure shingles, but they will provide pain relief, reduce inflammation, and speed recovery. Red pepper, also known as capsicum or cayenne, is so effective that it’s an ingredient in commercial ointments approved by the U.S. Food and Drug Administration. Commercial preparations include Zostrix and Capzasin-P. Red pepper is hot, so the ointment should be applied only to healed blisters. Red pepper is useful for treating painful PHN. Topical applications of lemon balm, licorice, or peppermint may reduce pain and blistering. These herbs may be brewed as teas and then consumed and applied to the skin. Herbal antivirals, such as echinacea , can be effective in fighting infection and boosting the immune system. Calendula ointment or lotion works to counter the virus. Sedative herbs such as passionflower can be brewed for a tea. Such herbs can help with treatment of post-herpetic neuralgia. Vervain helps relieve pain and inflammation. St. John’s wort, lavender, chamomile, and marjoram also help relieve inflammation. A person with shingles should consult a homeopath for specific remedies and dosages. Homeopathic remedies include Ranunculus, which is effective for shingles on the trunk. It is also taken for itching. A homeopath may recommend Rhus toxicodendron for blisters and Arsenicum album or Hypericum for pain. Practitioners of traditional Chinese medicine (TCM) recommend acupressure and acupuncture to alleviate pain. Acupuncture can help with post-herpetic neuralgia. In addition, a TCM practitioner may recommend herbal remedies such as Chinese gentian root, which is used to treat the liver. In addition, Chinese skullcap root is combined with water and used as a folk remedy for treating shingles in China. Also, certain herbal combinations can treat specific symptoms and contributing causes. For example, Long Dan Xie Gan Tang can quell the accumulation of damp toxic heat in the liver. For damp infected painful eruptions on the torso, Huang Qin Gao can be applied to the surrounding area. To boost the immune system, supplement the diet with vitamin B during the first one or two days. Until health returns, continue to supplement with vitamin B complex, high levels of vitamin C with bioflavonoids, and calcium. Food seasoned with red pepper (capsicum) may provide relief, as may foods containing the amino acid lysine. High-lysine foods include soybeans, black bean sprouts, lentils, parsley, and peas. Cool wet compresses may help reduce pain while blisters or crusting is present. Patients may be made more comfortable with the application of a cloth dipped in one-quarter cup (60 ml) of white vinegar mixed in two quarts (1.9 l) of lukewarm water. Compresses should be used twice daily for 10 minutes. When blisters dry up, the compresses may be discontinued. Soothing treatments such as colloidal oatmeal baths, starch baths or lotions, and calamine lotion may help to relieve itching and discomfort. When the crusts and scabs are separating, the skin may become dry, tight, and cracked. If that happens, a small amount of plain petroleum jelly can be applied to the area three or four times daily. Ayurveda is an Indian healing science that is more than 5,000 years old. Treatment is based on maintaining a balance between the body and the world. Treatment for shingles may include applying a turmeric paste to the skin. Relaxation techniques can be used to treat symptoms of shingles. Techniques such as hypnotherapy and yoga can help a person relax. Flower remedies are liquid concentrates made by soaking flowers in spring water. Also known as flower essences, 38 remedies were developed by the homeopathic physician Edward Bach during the 1930s. A 39th combination formula, known as Rescue Remedy is taken to relieve stress. The remedy is taken by placing several drops under the tongue four times daily. Alternately, the drops may be added to a glass of water. The patient drinks the mixture throughout the day. Reflexology is the manipulation of the foot to bring the body into balance. Reflex points on the foot correspond to parts of the body. These points can be treated by a reflexologist or at home by following instructions on a reflex chart. The antiviral drugs acyclovir, valacyclovir , and famciclovir can be used to treat shingles. These drugs may shorten the course of the illness. More rapid healing of the blisters results when drug therapy is started within 72 hours of the onset of the rash. In fact, the earlier the drugs are administered the better, because early cases can sometimes be halted. If taken later, these drugs are less effective but may still lessen the pain. Antiviral drug treatment does not seem to reduce the incidence of postherpetic neuralgia (PHN), but recent studies suggest famciclovir may cut the duration of PHN in half. Side effects of typical oral doses of these antiviral drugs are minor, with headache and nausea reported by 8–20% of patients. Severely immuno compromised individuals, such as those diagnosed with AIDS, may require intravenous administration of antiviral drugs. Corticosteroids such as prednisone may be used to reduce inflammation but they interfere with the functioning of the immune system. Corticosteroids in combination with antiviral therapy are also used to reduce severe pain and to treat severe infections, such as those affecting the eyes. After the blisters heal, some people continue to experience PHN for months or even years. This pain can be excruciating. Consequently, the doctor may prescribe tranquilizers, sedatives, or antidepressants to be taken at night. Attempts to treat PHN with famciclovir have shown some promising results. When all else fails, severe pain may require a permanent nerve block. Shingles usually clears up within three to five weeks and rarely recurs. There have been reports that shingles cleared up several days after licorice ointment was applied to the skin or when the homeopathic remedy Ranunculus was taken. If the nerves that cause movement are affected, temporary or permanent nerve paralysis and/or tremors may occur. Elderly or debilitated patients may have a prolonged and difficult course and recovery. For them, the eruption is typically more extensive and inflammatory, occasionally resulting in blisters that bleed, areas in which the skin actually dies, secondary bacterial infection, or extensive and permanent scarring. Similarly, patients with compromised immune systems usually have more severe courses that are often prolonged for weeks to months. They develop shingles frequently and the infection can spread to the skin, lungs, liver, gastrointestinal tract, brain, or other vital organs. Cases of chronic shingles have been reported in AIDS patients, especially when they have a decreased number of one particular kind of immune cell called CD4 lymphocytes. Depletion of CD4 lymphocytes is associated with more severe, chronic, and recurrent varicella zoster virus infections. Lesions are typical at the onset but may turn into ulcers that do not heal. Herpes zoster can lead to potentially serious complications. Many individuals continue to experience persistent pain long after the blisters heal. This post-herpetic neuralgia can be severe and debilitating. The incidence of post-herpetic neuralgia increases with age, and episodes in older individuals tend to be of longer duration. Most patients under 30 years of age experience no persistent pain. By age 40, the risk of prolonged pain lasting longer than one month increases to 33%. By age 70, the risk increases to 74%. The pain can adversely affect quality of life, but it usually diminishes over time. Other complications include secondary bacterial infections. Strengthening the immune system by making lifestyle changes is thought to help prevent the development of shingles. These changes include eating a well-balanced diet rich in essential vitamins and minerals, getting enough sleep, exercising regularly, and reducing stress. In 2002, reports from a large, five-year study showed that researchers might be nearing a workable vaccine for shingles. The vaccine is 10 times stronger than the chickenpox vaccine and similar in nature. Study results were planned for release in mid-2004.